Observing Mitosis with Fluorescence Microscopy - Digital imaging with fluorescence microscopy is becoming a powerful tool to assist scientists in understanding the complex process of mitosis on both a structural and functional level. Mitosis is the mechanism that allows the nuclei of cells to split and provide each daughter cell with a complete set of chromosomes during cellular division. This, coupled with cytokinesis (division of the cytoplasm), occurs in all multicellular plants and animals to permit growth of the organism. In this part of the Photo Gallery, we illustrate the various steps in mitosis that occur in onion root tips, which are relatively easy to capture in all stages. We apologize for the poor quality of the photomicrographs in this section, but it was built using pre-prepared (stained and mounted) microslides that we obtained commercially. In the future, we hope to obtain higher quality images. A normal resting cell exists in a state called interphase in which the chromatin is undifferentiated in the heavily-stained nucleus, as illustrated above. Before the cell enters the mitosis phase, it first undergoes a synthesis or S phase where each chromosome is duplicated and consists of two sister chromatids joined together by a specific DNA sequence known as a centromere. Centromeres are crucial to segregation of the daughter chromatids during mitosis. The first phase of mitosis is known as the prophase, where the nuclear chromatin starts to become organized and condenses into thick strands that eventually become chromosomes. During prophase, the cytoskeleton (composed of cytoplasmic microtubules) begins to disassemble and the main component of the mitotic apparatus, the mitotic spindle begins to form outside the nucleus at opposite ends of the cell. 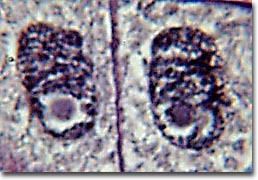 The photomicrograph below depicts the initial chromosome condensation at the beginning of prophase (early prophase) when the nucleolus is still intact. Late prophase, or prometaphase begins with the disruption of the nuclear envelope, which is broken down into small membrane vesicles that closely resemble the endoplasmic reticulum and tend to remain visible around the mitotic spindle. During this period the chromosomes continue to condense and gradually shorten and thicken until they have completely formed the units that will undergo mitosis. 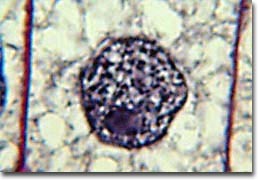 The nucleolus also disappears during this period. The mitotic spindle microtubules are now free to enter the nuclear region, and formation of specialized protein complexes called kinetochores begins on each centromere. These complexes become attached to some of the spindle microtubules, which are then termed kinetochore microtubules. Other microtubules in the spindle (not attached to centromeres) are termed polar microtubules and these help form and maintain the spindle structure along with astral microtubules, which remain outside the spindle. The next identifiable phase is called metaphase where the chromosomes, attached to the kinetochore microtubules, begin to align in one plane (the metaphase plate) halfway between the spindle poles. The kinetochore microtubules exert tension on the chromosomes and the entire spindle-chromosome complex is now ready for the next event. 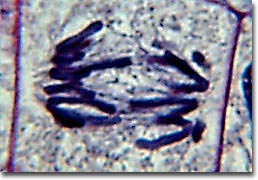 The photomicrograph below depicts onion root tip cell chromosomes in metaphase, ready for separation. The kinetochore and polar microtubules are clearly visible and radiate out the ends of the cell leaving the chromosomes in the middle of the complex. This sets the stage for chromosome separation in the next stage of mitosis: anaphase. Almost immediately after the metaphase chromosomes are aligned at the metaphase plate, the two halves of each chromosome are pulled apart by the spindle apparatus and migrate to the opposite spindle poles. The kinetochore microtubules shorten as the chromosomes are pulled toward the poles, while the polar microtubules elongate to assist in the separation. 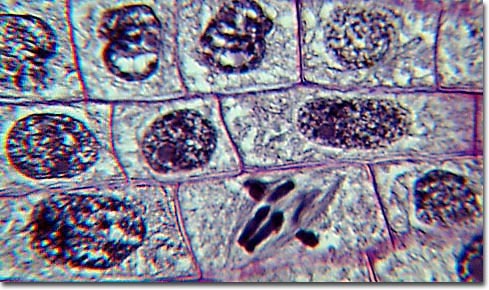 The photomicrograph below illustrates the early stage of anaphase where the chromosomes are just becoming completely separated. The microtubules are clearly visible in this complex. Anaphase typically is a rapid process that lasts only a few minutes. When the chromosomes have completely migrated to the spindle poles, the kinetochore microtubules begin to disappear, although the polar microtubules continue to elongate. 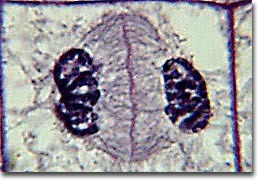 This is the junction between late anaphase and early telophase, the last stage in chromosome division. The photomicrograph below shows the positioning of the chromosomes in late anaphase. The polar microtubules are a clearly formed network and the synthesis of a new cell membrane has been initiated in the cytoplasm between the two spindle poles. In telophase, the daughter chromosomes arrive at the spindle poles and are eventually redistributed into chromatin. 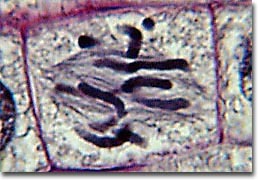 The process of cytokinesis, where the cytoplasm is divided by cleavage, also starts sometime in late anaphase and continues through telophase. After complete separation of the chromosomes and their extrusion to the spindle poles, the nuclear membrane begins to reform around each group of chromosomes at the opposite ends of the cell. 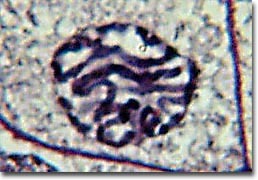 The nucleoli also reappear in what will eventually become the two new cell nuclei. 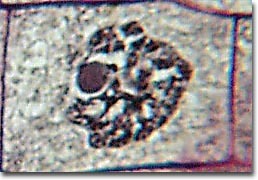 The photomicrograph below captures a cell in late telophase where the new membrane is beginning to divide the cell but the nuclei have not completely reformed and cytokinesis has not yet finished. 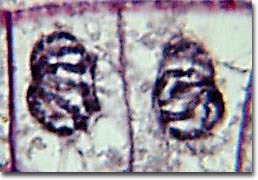 When telophase is complete and the new cell membrane (or wall in the case of the onion root tips) is being formed, the nuclei have almost matured to the pre-mitotic state. The final steps are completion of the total formation of a membrane between each of the new daughter cells to yield two separate new cells. The photomicrograph below illustrates two newly formed cells that have just completed the process of mitosis. We are continually in search of good samples for photomicrography. If you have any biological samples that might be acceptable candidates for examination under the microscope, please contact us using the links below.